Buy all three and pay only $4.59 each! 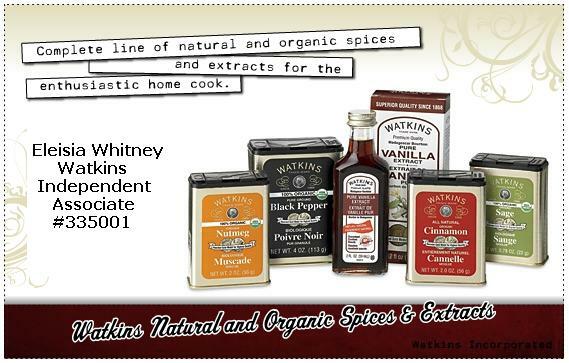 Watkins famous Original Double-Strength Vanilla (2 fl oz) and regular-sized Cinnamon and Black Pepper are boxed and ready to give to the teacher, babysitter or anyone else who would love Watkins superior quality. Warm up with three of Watkins most popular flavored cocoa mixes from holidays past! Perfect for cuddling up by the fire après-ski or after the holiday meal, these instant cocoa mixes deliver gourmet flavor instantly. Get yours now—after the holidays, they’ll be gone! Combine Watkins Cinnamon with the sweet, creamy taste of vanilla icing, and suddenly your morning toast tastes like a cinnamon bun! Just sprinkle on buttered toast; also great on cereal or oatmeal. This quick bread mix is flavored with a blend of apple and cinnamon for enjoyment at breakfast or part of a holiday buffet. Delicious as a loaf or as muffins. Few things are as naturally warming as the aroma of real pumpkin bread. Give the gift of fresh-baked pumpkin bread without all the hassle! Makes 1 loaf. Watkins Pumpkin Pie Spice gives this indulgent condiment the homemade taste of Grandma’s. All-natural and absolutely delightful! This delightful quick bread mix is flavored with a blend of orange and spice for enjoyment at breakfast or part of a holiday buffet. Snickerdoodles probably originated in New England in the 1800s, and nobody seems to know whether the name came from the Germans or Dutch, or if it was simply made up for fun. All we know is that they are delicious…and with Watkins, they’re easy! This traditional sugar cookie mix is back by popular demand. Watkins has taken care of all the work for you in this instant soup base! This rich and creamy baked potato soup will make a delicious quick and easy first course for any gourmet meal. It will warm you up on those cold nights...and - no one has to know it's instant. Just in time for the holidays, the company who brings you the world’s best vanilla and spices now offers Cream of Tartar. Essential for holiday baking and candy making, it is essential for meringue pies and angel food cake, and is the secret ingredient for making candy canes and gingerbread houses. To give more volume and stability to egg whites and a smoother texture to candy and frostings, Watkins Cream of Tartar is your answer! Enjoy your Thanksgiving turkey with this expertly blended rub! This convenient, pre-mixed rub has all of the spices and herbs needed to make your turkey delicious. Combine with your favorite Grapeseed Oil and rub liberally on your turkey, cook and enjoy! Cabin fever getting your down? Let the smooth scent of mango whisk you away to sunshine and balmy temperatures while our natural lotion, cream and oil nourish, replenish and hydrate even the driest winter skin - provides everything you need for a total skin makeover! Two of Watkins’ most popular 100% natural lip tints are coupled together to offer you or your loved one a perfect pucker! This special two pack contains Tickled Pink and Simply Mauve-lous. Buy all three and pay only $5.99 each! Watkins famous Original Double-Strength Vanilla (59 mL) and regular-sized Cinnamon and Black Pepper are boxed and ready to give to the teacher, babysitter or anyone else who would love Watkins superior quality. Watkins Cream of Tartar is your answer! Order Green, Red, and Yellow and get Blue for only $1.89. 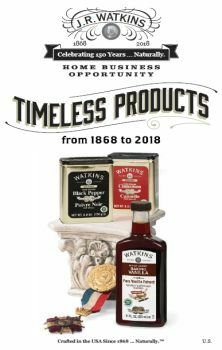 J.R. Watkins Natural Home Care Line is Growing!